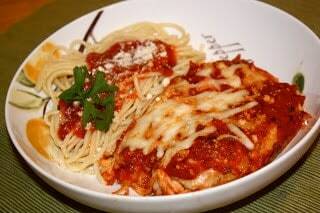 Simple chicken parmesan is my idea of perfect comfort food. This is one of Jeff’s favorites…which is convenient because it’s so easy to throw together on nights when I don’t feel like cooking. Place large skillet on medium heat. Add olive oil. Sprinkle the bread crumbs on a large plate. Beat the egg and milk in a medium sized bowl. Dip the chicken tenders in the milk mixture and then dredge them in the breadcrumbs. 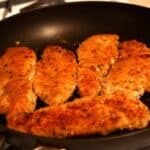 Place chicken tenders in skillet and cook until bread crumbs are brown; 3-4 minutes on each side. 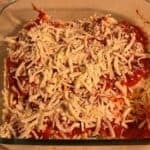 Place the chicken tenders in a casserole dish, and cover with a thin sprinkle of Parmesan cheese and mozzarella cheese. Layer marinara sauce over everything. Finish with another layer of cheese! YUM! Bake at 350 degress for 25-30 minutes or until bubbly. Great served with spaghetti noodles or salad.